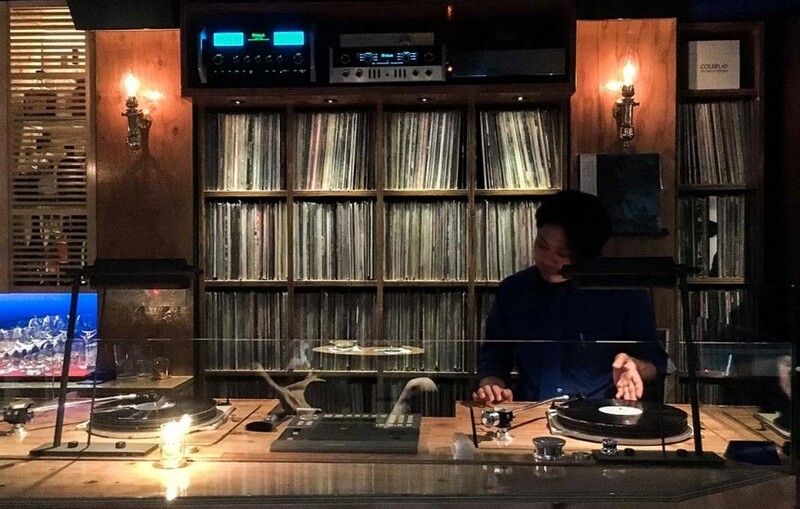 “I wish I lived in a room that had a sound system like this.” It was this remark 25 years ago that led to the naming of Shibuya’s The Room, a mainstay in Tokyo’s jazz and soul music scene. A club/bar hybrid, The Room attracts customers, musicians, and creatives of all types from around the world. Visitors will find an unpretentious atmosphere paired with a strong sense of individuality. The location’s name is fitting for its size. Literally a single-room space, located in Sakuragaoka-cho, with just a couple of seats near the door, the layout of the open floor area changes to accommodate the musical event scheduled each night. Visitors enter by descending a spiral staircase from street level. After passing through reception, the inside door swings open to reveal a long wooden bar bathed in dim, warm light from retro chandeliers, a cozy contrast to the otherwise jet-black interior. 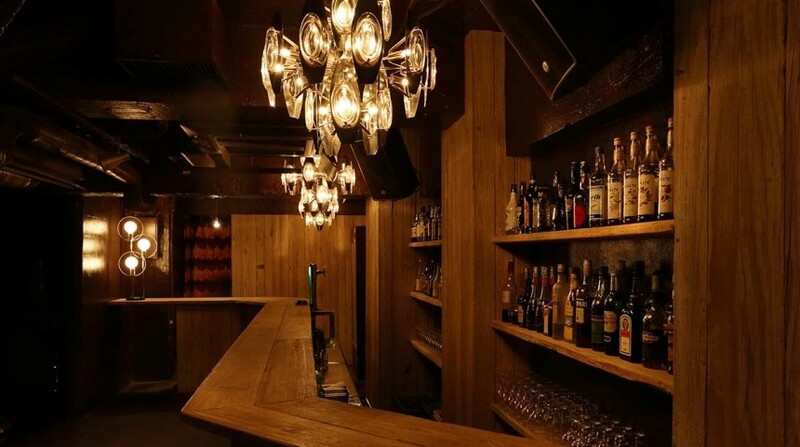 The Room’s strong sense of individuality is also apparent in its drinks (700-1000 yen); while the bar staff are responsible for creating the menu, Okino remarks, “there are also cases where I find a cocktail or liqueur overseas, get permission to import it, and we use that. The concept is creativity. Just as with the music, we want to create individualized cocktails.” Customers visiting The Room can describe the sort of thing they’re in the mood for, and bar staff will improvise a drink, creating something new just for them. 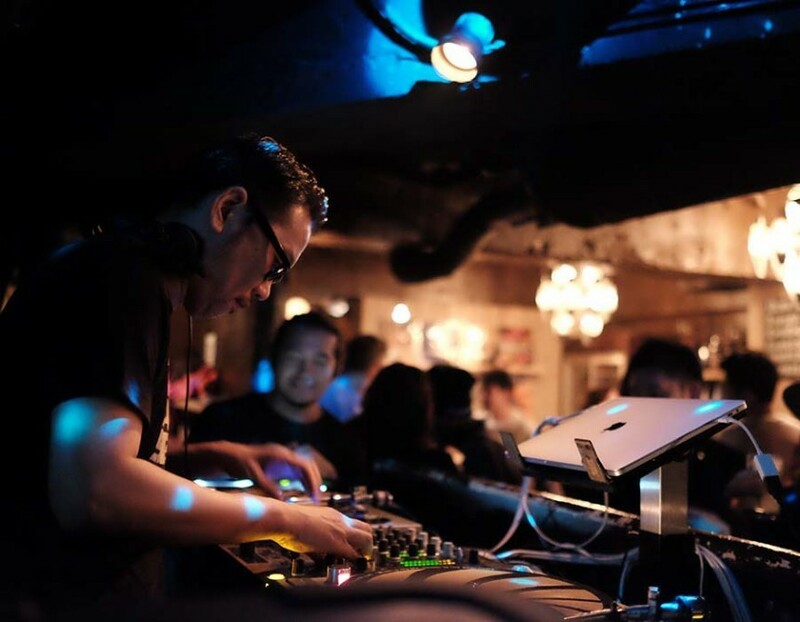 But for those who prefer a location with plush seating and a strong emphasis on drinks (but who are still looking for soul and jazz in an intimate setting), there is Ginza Music Bar. With deep blue fabrics as the focus color for the décor, a sunken dining area, and windows looking out over Ginza backstreets, the atmosphere is a refined hideaway. 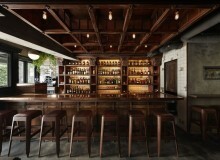 The bar area blends seamlessly into the DJ booth, which stands in front of a floor-to-ceiling record catalogue. Ginza Music Bar has a small food menu consisting largely of snacks and modest appetizers. Their seasonal drink menu includes a few original cocktails–at the time of this visit a spicy yuzu margarita, a “Japanese” old fashioned, and a tart martini were available. 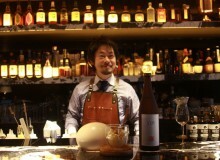 Presentations are classic with a bright twist, and drinks are made strong, certainly warranting the 1400-1600 yen price. There is also a menu of non-seasonal original drinks. Of course, standard drinks are available, and guests can customize their choice from the extensive liquor lists at the back of the menu. Though it opens at 6 PM, it won’t fill up until about 10 PM, by which time guests in bespoke tailoring will be enjoying lively conversations against a background of jazz and soul music. Stop by to enjoy selections from a guest DJ you’re a fan of or simply enjoy the selections from the staff. Check the napkin your drink is served on for a cheeky surprise.